Output Tests under KWP-2000/CAN/UDS includes simultaneous measuring data when available from the control module in question. To begin Output Tests, and to progress through each step, click [Start/Next]. In some cases an [Activate] button will appear, depending on the specifics of the control module. The Outputs that can be tested and the sequence in which they become active are controlled strictly by the Control Module; this is not a function of the Diagnostic Tester. To find out which Outputs can be tested and the sequence in which they will become active, please refer to the Factory Repair Manual for your car. Once the Test Sequence once it has been started, clicking [Done, Go Back] will take you back to the Open Controller Function Screen. The Test Sequence will still be active! 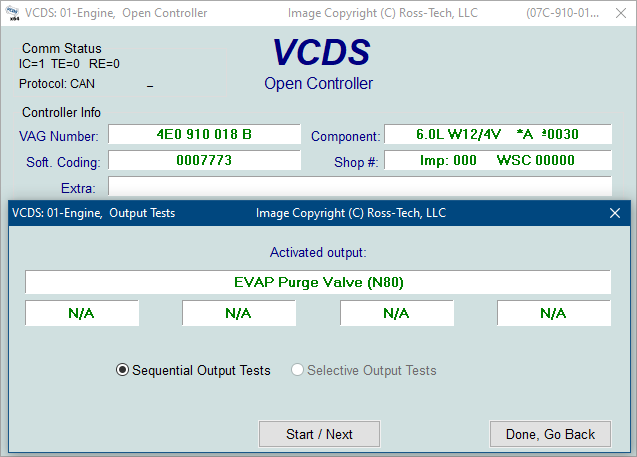 Most Control Modules will permit the Output Test Sequence to be run only one time per session. If you run the Test Sequence to completion, VCDS will allow you to return to the previous screen without closing the session, but you may not be able to run the Output Test Sequence again. If you need to run the Sequence again, manually Close the Controller and re-start the session. On some cars, you must cycle the key OFF and ON or even start the engine (to clear the cylinders of fuel). Some Output Tests require additional action before they become active. Fuel Injectors are a common example. To activate a Fuel Injector, you must press (and in some cases release) the gas pedal. Exact details can be found in your Factory Repair Manual. 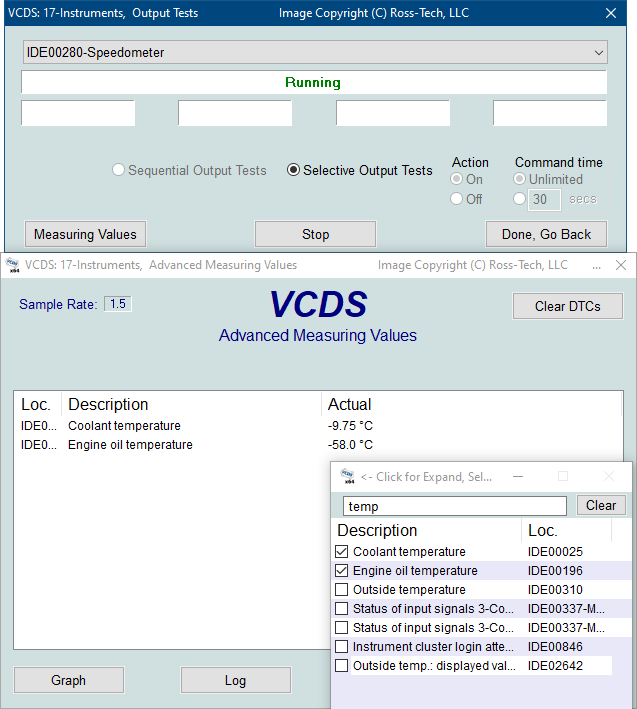 On most systems, the Output Tests function is only available when the Engine is not running. It is perfectly normal to see a "short to ground" message in the process of running Output Tests. The ECU identifies which output it is currently testing by sending a fault-code number. On many ECUs the full text for this fault code includes "short to ground". Why? Because one side of the actuator in question has 12V on it all the time and the ECU completes the circuit (and turns the actuator on) by pulling the other side to ground. Selective Output Tests. On those modules that support it, this is a more sophisticated version of the traditional (sequential) Output Test function. It allows the user to select a particular output and activate it directly without going through a pre-defined sequence to get there. Some modules (including those using UDS) have outputs which can only be tested this way. Selective Output tests requires supporting data in a label file. There is no way to efficiently query a control module to find out which outputs are supported. 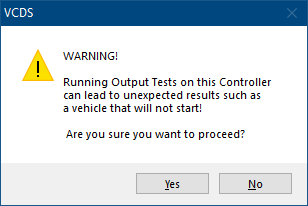 Do not use the Output Tests function on any system while the car is in motion! Running Output Tests on the ABS brake system can temporarily disable the brakes entirely and cause individual wheels to lock and unlock. We strongly suggest you refer to the Factory Repair Manual for your specific car before running Output Tests on any Control Module so you will know what to expect! For example, in the VW Touareg, a specific procedure must be performed to be able to start the vehicle if Output Tests on the Airbag Controller have been performed. Use [Done, Go Back] to return to the Controller Info / Select Function screen.